Superior Quality: Fullmosa® 100% Genuine Full Grain Calf Leather Band - soft and comfortable to the touch. No plastics or cheap fillers. Certified RoHS compliant - free of hazardous and toxic substances.For more product options, please visit our store by clicking the blue Fullmosa logo above the product title. Sizing: 38mm band for wrist size 5.4 - 7.5 inches. 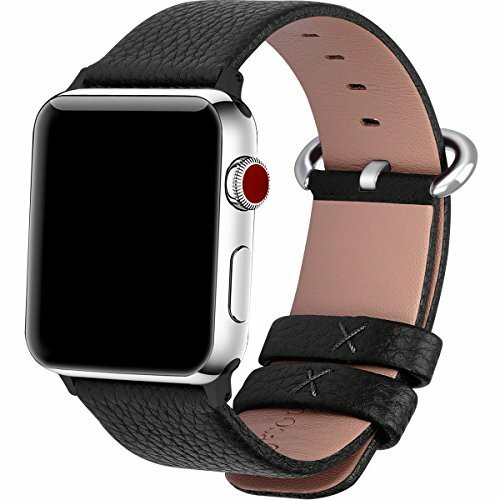 Designed for use with Apple Watch Series 1&2&3 Sport & Edition (2015, 2016,2017). For 42mm band search ASIN: B015WKAOK8 Easy installation: Our newly designed connector with micro-bounce technology makes installing and changing bands simple. Simply slide the spring loaded metal lugs into your Apple Watch and your watch is ready to wear. The included Assistant Tool makes changing bands easy. Insert the tool to remove the current band and slide in the new one. Appearance: Stainless Steel C-shaped clasp and buckle,and black adapters provide a simple yet elegant look. Our cross stitched collars ensure durability and reliability to keep your ban strap secure and tucked in. The unfixed collars make size adjustment a breeze and allow you to customize the band for a perfect comfortable fit. Notice: Please ensure you choose "Sold by Fullmosa®" for guaranteed quality. We are the ONLY authorized retailer of our brand. If you have any problems with your order please contact us for prompt and courteous service. Our contact information can be found on the every genuine Fullmosa® box..